Our Service department is undoubtedly the most important part of our business. Because our commitment to you doesn’t stop once we’ve installed a compressed air system and driven away. Regular maintenance will ensure that the HPC air compressors that we supply remain operating reliably and at peak efficiency. 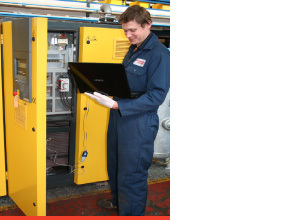 Our engineers are regularly trained and certified to the highest standards. This includes full training on all ancillary equipment (including gas handling) and compliance with the latest legislation. We also support all of the popular compressor manufacturers, including Atlas Copco, Compair, Ingersoll Rand and Hydrovane. Whatever your problem is, we can fix it.